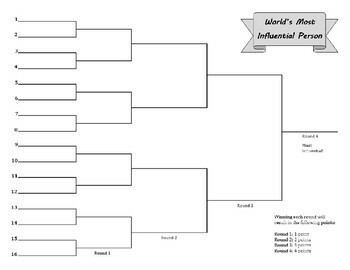 Get students actively involved in class by having them debate and complete a bracket to determine who the most influential person in history has been! 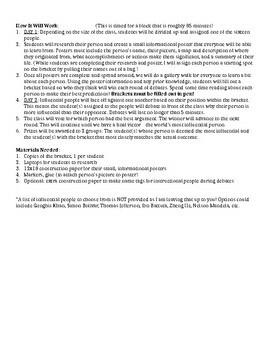 This activity involves students conducting research, creating informational posters, making predictions and filling out a bracket, and effectively communicating who they think should be deemed the most influential person in history. A bracket, step by steps instructions, and some ideas for contenders are all included! Even though this activity was originally created for a world history course, it could be easily modified for a variety of content areas: English, science, US history, art, etc.